Pumpkin season is my jam. I love all the pumpkin breads, and cookies and pies and desserts. I spend most of the year waiting until it’s appropriate to make all of the things on my “Things Made With Pumpkin” Pinterest board. It’s a sickness. So, I knew I wanted to try a pumpkin cocktail. I knew I wanted to use real pumpkin as opposed to syrup. And I knew I wanted it to be thick and delicious. My good friend Heidi tasted bad cocktail after bad cocktail with me. Really y’all, they were terrible. I tried really hard to use your basic pumpkin puree… healthy, delicious. But it just wasn’t cutting it. Pumpkin Pie Filling to the rescue. I’m sure there’s more sugar in it than I would have had to add to the pumpkin puree, but what you don’t know won’t hurt you, yeah? Add ice, whiskey, milk & pumpkin pie filling to blender. Blend on high for one minute, or until ice is broken down. 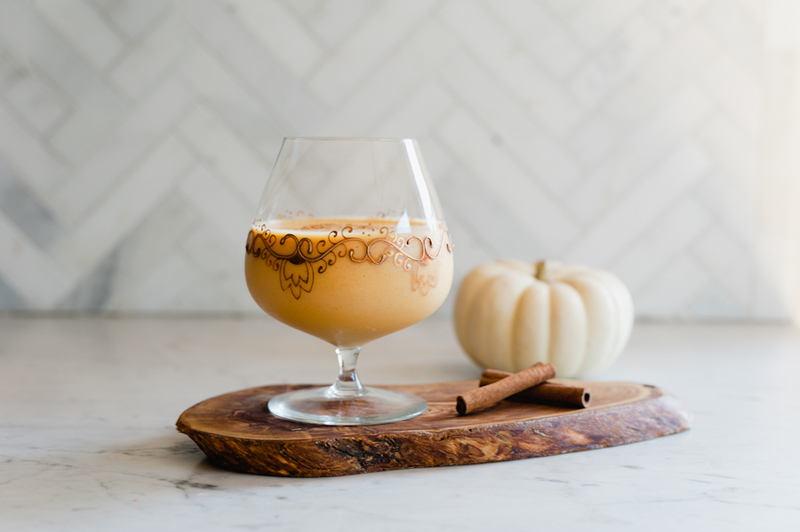 Pour into glass and garnish with a cinnamon stick, pumpkin pie spice or nutmeg. Enjoy! November 11, 2014 Featured on Glitter Guide! I’ve been such a big fan of Glitter Guide for such a long time. It’s just full of so much pretty I feel inspired every time I stroll through. 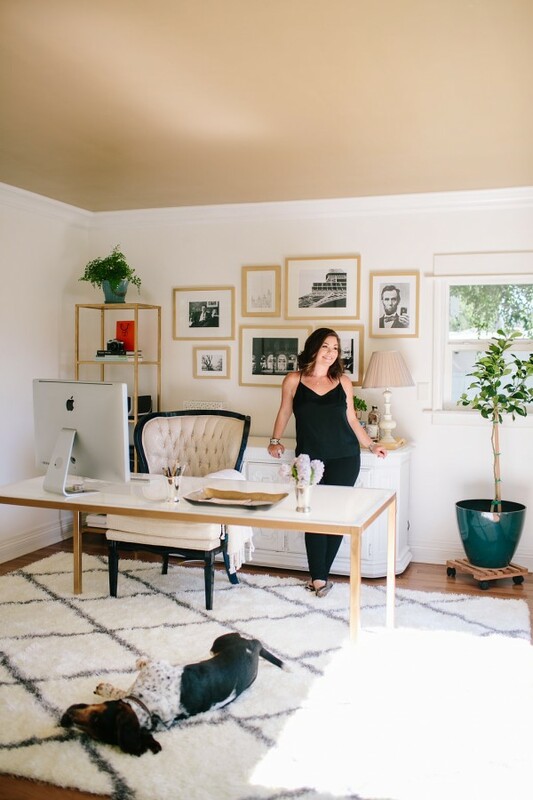 So, when my dear friend and amazingly talented photographer Heather Kincaid suggested we shoot my house and send it over to them I was excited/thrilled/nervous/nauseous. I started and finished a major renovation, then pushed our shoot date back three times. I was petrified. But, I’m sooooo happy that we did this because I’m so happy to have these images and so honored that Glitter Guide featured our house today! You can see the full home tour here, and expect more images coming to the blog soon! Thank you so much Heather for doing the most amazing job photographing this place I love so much! And Moira for making me look so amazing. And the ladies at Floral Crush for the icing on the cake… flowers just make everything better! Whew, I didn’t realize I’d been so absent! Wedding season is finally gearing down and I just realized how much I’ve neglected this poor blog that I just adore so much. But yah for fall, yah for sweaters and pumpkins and apple pies! If you follow me on Instagram (Cocktails For Breakfast or Hazelnut Photography) you’ll know that Chris and I went out to Riley Family Farms a few weeks ago for some apple picking! It was obviously adorable, a super cute little place with some super delicious apples. It was a lovely little trek out of LA for the day and we came home with the most delicious apples. So, pie. On the drive out, I was reading Sunset Magazine and they had a recipe for a Caramel Apple Pie. Done & done. It takes forever. Like, three days forever. Mostly because I didn’t really read all the way through to make sure I built in time for all the chilling and cooling and sitting. There’s a lot of it. But the dough can sit for a few days. The apples can sit overnight. It’s not so overwhelming to break it down into a few separate baking sessions. It’s just the massive amount of patience you must have. Lots and lots of patience. Guys, it’s worth it! 1. In a food processor, whirl flour, sugar, and salt. Add butter and pulse until pieces are almond- and pea-size. Sprinkle 1/4 cup plus 2 tbsp. ice water over mixture and pulse 3 or 4 times just to distribute. 2. Dump mixture into a mound on a work surface. Working quickly so butter stays cold, firmly press dough with heel of hand, pushing dough outward from center. Scrape dough from work surface using a bench scraper, and toss to redistribute wet and dry patches. Repeat, pressing on dry patches and tossing to create a soft dough with no dry spots. Don’t overwork; you should see pieces and streaks of butter. 3. Divide into 2 portions and gently press each into a 3/4-in.-thick disk. Wrap each in plastic wrap and chill until firm, at least 2 hours and up to 2 days. Make ahead: Up to 1 month, frozen airtight. 4 pounds mixed apples, such as Granny Smith and Cripps Pink, peeled and cut into eighths to make 3 qts. 1. Make pastry and chill. 2. Meanwhile, melt butter with 1 cup sugar and 1/2 tsp. salt in a heavy 5- to 6-qt. pot over medium heat. Cook, stirring constantly, until a smoky haze comes from mixture and it turns deep golden brown, 6 to 9 minutes. Carefully stir apples into caramel (it will bubble and seize up). Cook, stirring often and reducing heat if needed to maintain a steady simmer, until apples look mostly translucent and are tender when pierced with a fork (a few will have fallen apart), about 20 minutes. Transfer apples and caramel to a rimmed baking sheet. Let cool a bit, then chill until cold. 3. In a small bowl, whisk egg yolk, cream, and a pinch of salt until well blended. Chill egg wash airtight up to 1 week. 4. Unwrap and lightly flour 1 pastry disk, work surface, and rolling pin. Working from center with short strokes, roll pastry into an even 13-in. round. As you work, lift pastry using a bench scraper or long metal spatula, and reflour board and pin as needed to keep it from sticking. 5. Fold pastry in half and open up into a buttered regular 9-in. pie pan, easing it into place without stretching. Fill shell with cold apples and caramel; pat into an even mound. Fold overhanging pastry over apples and trim with scissors to a 1-in. border. Chill scraps and pie shell. 6. Roll out second pastry disk the same way as the first to an 11-in. round. Cut shapes close together with a floured 2 1/2-in. cookie cutter. Transfer to a baking sheet. Gather and reroll all scraps and cut the same way (you’ll have about 25 cutouts total). Chill cutouts until firm, 15 minutes. 7. Brush pie border with egg wash. Lay 10 cutouts in a concentric circle around rim of pie, barely covering the border and barely overlapping one another; brush with egg wash, so they adhere to one another. Make a second circle the same way with 5 cutouts, overlapping the first by about 1/2 in. Set 1 cutout in the center. 8. Freeze pie and remaining cutouts uncovered until cutouts feel very firm, 20 to 30 minutes. Meanwhile, preheat oven to 350° with racks in center and lower third. Brush pie with egg wash again and sprinkle with remaining 1 tbsp. sugar. 9. Bake cutouts on baking sheet until well browned, 20 to 22 minutes. Bake pie until crust is deeply browned, juices are bubbling, and an instant-read thermometer inserted in center reaches 180°, 1 1/2 hours; after 45 minutes, set a drip pan on rack under pie, and after about 1 1/4 hours, tent pie with foil. Cool pie on a rack at least 2 1/2 hours. Serve with extra cutouts for nibbling. Make ahead: Up to 1 day at room temperature.